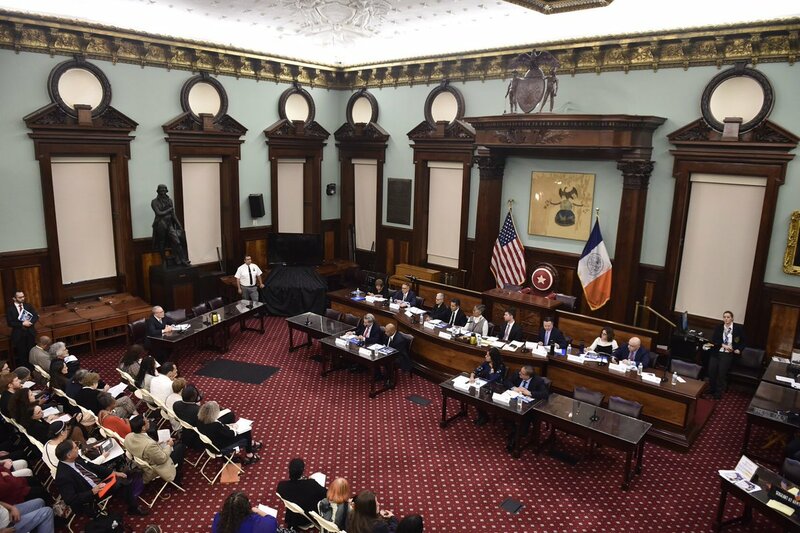 On Thursday, September 27, 2018, the New York City Charter 2019 NYC Revision Commission held a public hearing in the Council Chambers at City Hall to gather testimony, from New York City residents, institutions and stakeholders regarding the potential amendments to the City Charter. Among the attendees were NYC Council member Ben Kallos and Anirudh Dinesh, a Research/Tech Associate Fellow representing The GovLab, who both took time to advocate for the incorporation of CrowdLaw–technology-enabled public participation in law and policymaking–practices within the New York City Council. The idea of incorporating more citizen engagement into law and policymaking processes is showing signs of forward momentum. In addition to Anirudh’s testimony, New York City Council Member Ben Kallos also proposed integrating CrowdLaw in the New York City Charter in his recent written testimony submitted to the commission. “The City’s Charter is in desperate need of an upgrade for the next generation,” Council Member Kallos stated in his written testimony. He then went on to highlight several key ways that the City could modernize the Charter, including an examination of who is empowered to make decisions on behalf of the 8.7 million NYC residents. In the same testimony, Kallos explained how he has engaged citizens who have ideas for legislation – from adults to kindergarten students – to work in partnership with his office to advance legislative proposals. Those efforts have yielded tangible results, and in several instances, resulted in the introduction and hearing of bills, and even the passage of citizen-led legislation. “CrowdLaw” – a term coined by GovLab – describes the institutionalization of participatory practices by parliaments, legislatures and city councils. The GovLab’s CrowdLaw Catalog, for example, showcases over 100 examples from 39 countries and 6 continents that demonstrate how legislatures, parliaments, city councils, and public bodies around the world are leveraging technology to involve more people in the process of creating policy and law. As governments around the world face increasing pressure, compounded by a loss of confidence from their citizens, CrowdLaw offers a way to harness the capacity of collective intelligence and technology, enabling citizens to work collaboratively with their respective governing institutions to improve how laws and policies are made. Kallos acknowledges that, while NYC involves citizens in determining the allocation of discretionary funds through participatory budgeting, and some officials like himself do engage citizens in the legislative process, there is still a need for an institutional method for residents to submit legislative proposals, and also to engage in the actual drafting of legislation put forth by the Council and/or the Mayor. While involving citizens in the legislative process can pose several challenges – a fact Council Member Kallos acknowledged in his testimony – reluctance to change and the fear of potential hurdles should not be reason to let the legislative process remain obscure. Council Member Kallos’ written testimony can he found here. Video of Dinesh’s in-person testimony can be found here. For more information on CrowdLaw, and to sign the CrowdLaw manifesto, click here.